Heavy rain has lashed Cuba since Friday, flooding streets and leaving at least two people dead. A number of buildings have collapsed in the capital, Havana, authorities say. A 54-year-old man and a 60-year-old woman are reported to have died as a house crumbled in central Havana. Up to 7.8in of rain fell overnight and the Cuban meteorological service has forecast more heavy rain for Saturday, particularly in the western and central regions. He says he narrowly escaped because he had to leave the house to go to work. 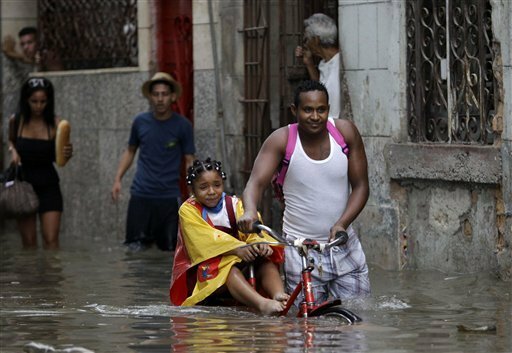 Many streets in Havana remain submerged, as the authorities assess the damage to other derelict buildings in the city. Bad weather also led to the closure of the picturesque Malecon seaside boulevard, lashed by stormy waves, AP reported. The torrential rain is expected to bring flooding to coastal areas in western Cuba and the central region.